12-22-2015 Desert National Wildlife Refuge (DNWR) - Visitors Center at Corn Creek. I got a Facebook event invitation to attend a beginners bird walk at the visitor center and figured, what the heck, maybe we will see a road runner or two. I thought it will be nice to get out walk around in the desert even if we don't see much. I was sure surprised when we ended up seeing 17 different bird species, and saw a few birds that my wife and I had never seen before. Western bluebird male watches over the other females nearby. The Corn Creek Visitors Center is just a few miles north of Las Vegas, Nevada, just off of US95. I am told that it is one of the best places to see the most species of birds, particularly in Fall and Spring. We were assisted in identifying a list of birds by a DNWR Volunteer, Michele Reyes. She helped us find and identify the following: Ruby-crowned kinglet, Western bluebird, Sharp-shinned hawk, Verdin, Ruddy duck, Bufflehead, Say's phoebe, Cedar waxwing, Spotted towhee, Dark-eyed junco, Song sparrow, White crowned sparrow, American robin, Common raven, Northern mockingbird, Phainopepla, and one other bird which shall remain nameless because I forgot to write it down. Incidentally, we did not see any roadrunners. A Say's phoebe looking for bugs. 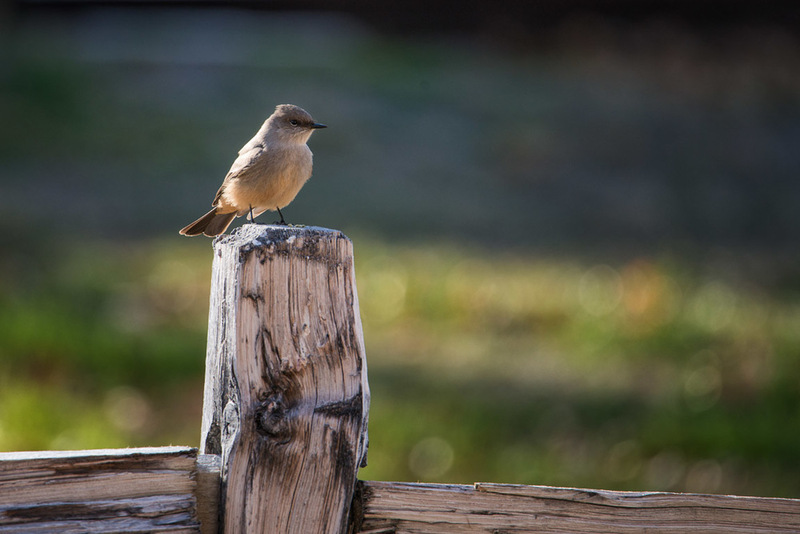 Not only is the Corn Creek Visitor Center a great place to see birds but it is a nice place to walk around in shade and it is a great place to learn about the desert habitat and the plants and animals you might get to see while you are exploring. I highly recommend a trip out to the DNWR and any of the bird walks and other interpretive activities they have going on. Kanarraville Falls on an Off-Season Visit. Located approximately 2.5 hours north of Las Vegas on Interstate 15. Which do you prefer, communing quietly with nature by yourself and maybe one or two other people or do you like a bigger group of friends with music, noise and a lot of social interaction? A few months ago I returned to Kanarra Creek, one of my favorite waterfall/slot canyon areas and was shocked by the sheer number of hikers squeezed into every nook and cranny of the canyon. My wife and I went to visit Zion National Park over Spring Break and again, I was shocked at the number of hikers we encountered, hundreds cued up to board busses for the shuttle ride . Kanarraville Falls on Labor Day Weekend. This got me thinking about the “nature” experience whether or not I can enjoy visiting National Parks anymore. I like to listen to the sounds of nature like birds chirping, cicadas buzzing, the wind blowing through the treetops and the rustle of dry vegetation as an animal brushes against. I can’t hear these sounds if the animals are scared away and the noise of people yelling, laughing and singing overwhelm the sound receptors in my head. I like to witness and feel what nature is like with me as quiet participant sharing space with all of god’s creatures without the overwhelming influence of the human being. This is only one kind of nature experience for me. When I think about it long and hard, I have to admit that I enjoy camping with a group of friends, sharing campfire cooked meals, beverages and marshmallows roasted on a stick. This is a uniquely human social experience. There is some kind of special bond that develops between people who “rough it” together in a natural setting. This is all about sharing experiences with other people and is not really about sharing with other creature unless you count squirrels, blue jays and the occasional bear that roams through your campsite. I have all kinds of fond memories of camping with large groups. I think the disappointment I felt when visiting Kanarra Creek was because the previous visit was full of solitude so I expected that and when we didn't experience it again it was a let down. I now realize that if I want solitude in Zion, I will have to plan a visit in winter when the park is not crowded or hike on trails that are less congested like The Subway or Kolob Arch. All is not lost…I just need to plan better for the kind of experience I wish to have. Which do you prefer? If I had to pick one, I would go it solo. The trail from the Sunrise Trail Head to Lake Las Vegas is paved and is fairly easy with a few steep sections. Click Sunrise Trail for more images. This weekend is perfect to get out in the desert for a bike ride or a hike. Many of the desert plants are blooming and the temperature is just right, not too hot and warm enough to feel just right. Indigo bush near Sunrise Trail Head. If you prefer hiking, Red Rock is a great option. Jody and I saw a lot of blooms along the First Creek trail including:dune primrose, desert marigold, globe mallow, golden bush, straggling mariposa lily, desert four o'clock, Utah penstemon, scarlet gaura, Indian paintbrush, white sand verbena, woolly daisy, paper bag plant, yerba santa, banana yucca and strawberry hedgehog. If you go early, look for coyotes. If you prefer a paved walkway or an easy bike ride, some very rare bear poppies and fully blooming indigo bush can be seen just a few hundred yards beyond the Sunrise Trail Head of the bike trail on the east side of the Clark County Wetlands Park. I remember hearing someone say they couldn't wait to see the indigo bush bloom, and until yesterday, I couldn't imagine what the big deal was. The indigo bush is spectacular and there are hundreds of them blooming very close to the Sunrise Trail Head. If you go early in the morning, you might see a coyote or two. The rare and beautiful bear poppy seen along the trail. You can ride from the Sunrise Trail Head down to Lake Las Vegas and back in half a day. Jody and I rode down to Lake Las Vegas and enjoyed lunch at one of the cafes in Lake Las Vegas and then rode the seven or eight miles back up to the Sunrise Trail Head making a full and relaxing day of it. The only downside to the trip is the trashy condition of the park facilities at the Sunrise Trail head. The facilities are frequently used and abused by local party goers and vandals. There is graffiti, trash and evidence of vandalism everywhere. It is sad and embarrassing. You can reach the Sunrise Trail Head by following Charleston or Vegas Valley all the way east and then turning right on Hollywood. Follow Hollywood south as it turns east and passes a water treatment facility. You will see the Sunrise Trail Head on the right as the paved road ends and turns to dirt road. As usual, take plenty of water and have plans for emergencies such as flat tires. There are times when you will be three or four miles from the nearest phone. The Bear Paw Poppy makes its home in gypsum rich soil. It is a rare and beautiful sight in the desert. Click this picture or Image Collections to see more photos from Anniversary Narrows. The highlight of our trip to Anniversary Narrows in late March was a rare sighting of the critically endangered bear paw poppy (Arctomecon californica). In close second to the bear paw was a fascinating trip back in time as walked up Lovell Wash through the Anniversary Mine area to the base of the narrows bearing the same name. Pollination of Bear Paw Poppy. We chose the hike up Lovell wash instead of driving up to the narrows so that we could venture into side canyons looking for the bear paw poppies. We heard they were in bloom in the area and I had never seen one of these rare beauties. Our knowledgeable guide and friend Aaron Leifheit led us into Rainbow Canyon. Rainbow Canyon is a little, incredibly colorful side canyon, on the left, about 300 yards north of Northshore Road(167) up Lovell Wash. We were rewarded with an amazing show of brilliant yellow poppies growing out of the wash floor, the canyon walls and all over the red hillside. We then headed further up the wash toward the mine and the narrows where, along the way, we were treated to some awesome views of geologic folds, layers of volcanic ash, yellow, purple, white and red rock formations. After about an hour of hiking we reached the mined area where we were surprised to see numerous cars parked. At this time (March 2014), the road is easily driven all the way up to the entrance of the narrows. Sometimes the road is washed out rendering the mine and the narrows inaccessible by car. Jody and Caroline enter Anniversary Narrows. The Anniversary Mine is a ghost mine of sorts, having peaked in the 1920s tapping into Borate/Colemanite deposits. Walking around the mined area, just down the wash from the narrows, one can imagine bygone days when the mines were active. There are remnants of infrastructures protruding from the sides of mountains, wrecked cars wedged into crevasses at the tops of canyons and fenced off entrances to mine shafts. Hiking up Lovell Wash for another half a mile or so, we reached the mouth of the narrows which is unexpectedly nondescript. Once you actually enter the narrows you realize how beautiful and striking the canyon is. The walls of the canyon shoot up some thirty feet overhead where the floor of the canyon is only a few feet wide. The narrows are cooler and shady so it is a relief to be there after a hot long hike. Being inside of the narrows was relaxing and peaceful. Even though there were many people in the area, it was easy to feel immersed in nature and away from the hum-drum of human activity. This is definitely a destination for the cooler months. As usual, bring lots of water and do not enter the area when there is the threat of rain as the narrows and wash are extremely dangerous when water is flowing. As with any hike in the desert, be careful where you put your hands and feet so you don’t end up startling a venomous creature or stepping on an endangered plant. Get out and enjoy the beauty of the desert. For a good description of how to get to Anniversary Narrows, check out http://www.birdandhike.com/Hike/LAME/LovellWash_Narrows/_Lov_Narrows.htm . My favorite view of Lake Mead and Hoover Dam is from high on the bluffs of Fortification Hill. Dave and Jody made it to the top of Fortification Hill. It is a challenge to get there but on a coolish spring day the trip is delightful. This hike is not for the casual hiker as it is very steep and requires some boulder scrambling at the top of the trail. We even had to hand our dogs up and down a vertical section of the trail. It was too steep even for our trail-savvy four legged friends. Once we got to the top of the butte and out on to the flat top of Fortification Hill, we were awestruck by the incredible vistas in all directions. The flat top is long and requires a long walk to the north to reach the highest point. Along the way you get to see some really interesting geologic features like an ancient volcanic crater off to the east. Once you reach the high point, the view cannot be topped. This is a nice place to settle down for a rest and some lunch. There are plenty of large rocks to sit in between in case the wind is blowing. During early March there are some very pretty flowers along the road driving in to the trail head. We saw many Silverleaf sunray (Enceliopsis argophylla), a relative of the sunflower that grows in the very unique conditions near Lake Mead. Plan to make this a day trip and bring a flash light or head lamp if you get a late start. As usual, bring lots of water and watch out for snakes and other creatures in the rocks. To get there from Las Vegas or Henderson, travel south on highway 93 over the Mike O'Callaghan–Pat Tillman Memorial Bridge to Exit 2, Kingman Wash Access Road. Turn left at the bottom of the off-ramp and follow the rough, dirt road for approximately 3.5 miles where you will come to some permanent restroom/outhouses. Look for a road (Fortification Hill Road) going to the right from just before the outhouses that goes up another wash to the southwest for just under 3 miles to the Fortification Hill trail head on the left. For some good directions and pictures of trail conditions, check out http://www.birdandhike.com/Hike/LAME/Fort_Hill/_Fort_Hill.htm .